It’s not a colour I would wear, so I am going to give to to my youngest daughter Eva, as she loves to borrow my shawls for dressing up. I do really like the pattern however, and I have started one for myself in the Navy Fyberspates alpaca laceweight (see previous post). 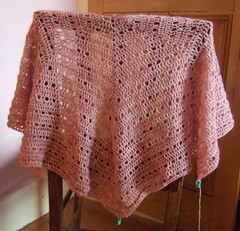 I will post the pattern here in the next few days when I have worked the border out. I’ve also finished the Ruffle Sweater I have been test crocheting for Diana from Mooseknits. 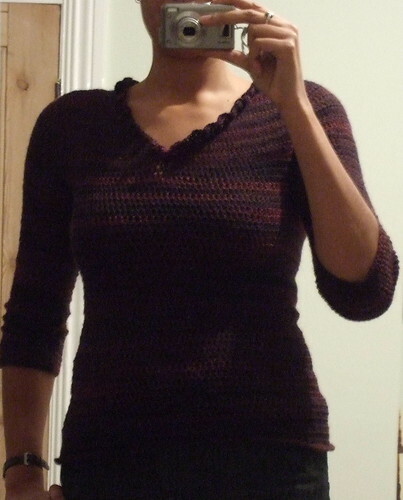 It’s a really nice pattern with an interesting construction ( seamless, top down with set in sleeves). It’s comfortable and fits really nicely. It took less than 3 balls of Schoppel Admiral sock yarn. She will be publishing this pattern on her blog in the near future. The Ruffle Sweater looks very good. I like it very much and I can’t wait to see the pattern.